Green is usually associated with either spring freshness or something magical and mysterious. It’s up to you to choose which image is right for you—the flowery girl or the seductive witch. There are many different shades of green that will allow you to realize all your ideas and fantasies. This is one of the definite pluses of makeup done in green shades. However, it is not so easy to create; there are some secrets and subtleties to employ during its creation and we are going to talk about them here. First of all, you should remember that the lighter your eyes are, the less saturated the primary shade of green must be. For dark-brown eyes you can choose herbal or emerald colors, for lighter eyes green and golden makeup will fit fine. For light-green eyes choose a muted khaki, olive, and pistachio. How to Create Makeup in Green Shades? First, apply brown eyeshadows to the entire upper eyelid and then start adding green eyeshadows. The lightest shade should be applied on the inner corner of the eye and to the area under the eyebrow; the darker one should be put in the middle. Finally, the darkest color should be applied on the outer corner of the eye, going beyond it, as well as on half of the lower eyelid. Be sure to carefully shade boundaries to create smooth transitions from one color to the next. Makeup done in green shades cannot be created without a black eye pencil or eyeliner. An arrow will emphasize the shape of the eyes and will correct any flaws. You can also use brown or dark gray eyeliner. A main requirement is to have these; otherwise, the makeup done in green shades will look like a shapeless green spot. Mascara should also be black, but don't use too much, one or two coats should suffice. 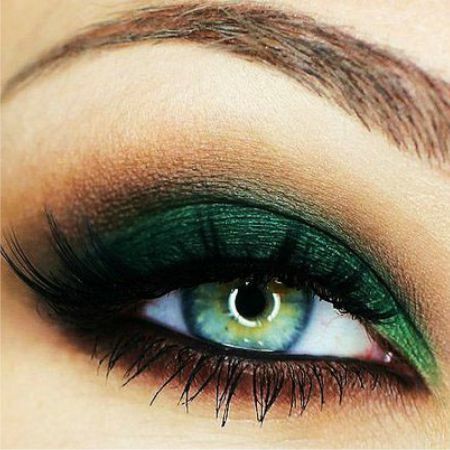 Makeup done in green shades will perfectly suit girls with green and brown eyes. But this does not mean that all other women shouldn’t use green. If you want to experiment, do it. Just do not mix green shades with such colors as blue. Other elements of your image are also important. For example, the condition of your skin is crucial. Of course, we all want our skin to be perfect, but in this case it is not just a wish, it is a necessary condition. If you do your makeup in green shades, the skin should be monitored more carefully than usual. Do not use bronze blush with green. We wish you success creating some of your own makeup styles in green shades! Like the article «Makeup in Green Shades»? Share it with friends!